A synagogue (pronounced /ˈsɪnəɡɒɡ/; from Greek συναγωγή, synagogē, 'assembly', Hebrew: בית כנסת bet kenesset, 'house of assembly' or בית תפילה bet tefila, "house of prayer", Yiddish: שול shul, Ladino: אסנוגה esnoga or קהל kahal), is a Jewish or Samaritan house of worship. Synagogues have a large place for prayer (the main sanctuary) and may also have smaller rooms for study and sometimes a social hall and offices. Some have a separate room for Torah study, called the בית מדרש beth midrash "house of study". Synagogues are consecrated spaces used for the purpose of prayer, Tanakh (the entire Hebrew Bible, including the Torah) reading, study and assembly; however, a synagogue is not necessary for worship. Halakha holds that communal Jewish worship can be carried out wherever ten Jews (a minyan) assemble. Worship can also be carried out alone or with fewer than ten people assembled together. However, halakha considers certain prayers as communal prayers and therefore they may be recited only by a minyan. In terms of its specific ritual and liturgical functions, the synagogue does not replace the long-since destroyed Temple in Jerusalem. 11 List of "great synagogues"
Israelis use the Hebrew term beyt knesset "house of assembly". Ashkenazi Jews have traditionally used the Yiddish term shul (cognate with the German Schule, 'school') in everyday speech. Sephardi Jews and Romaniote Jews generally use the term kal (from the Hebrew Ḳahal, meaning "community"). Spanish Jews call the synagogue a sinagoga and Portuguese Jews call it an esnoga. Persian Jews and some Karaite Jews also use the term kenesa, which is derived from Aramaic, and some Mizrahi Jews use kenis. Some Reform, Reconstructionist, and Conservative Jews use the word "temple". The Greek word synagogue is used in English (German, French and most Romance languages) to cover the preceding possibilities. Although synagogues existed a long time before the destruction of the Second Temple in 70 CE, communal worship in the time while the Temple still stood centered around the korbanot ("sacrificial offerings") brought by the kohanim ("priests") in the Temple in Jerusalem. The all-day Yom Kippur service, in fact, was an event in which the congregation both observed the movements of the kohen gadol ("the high priest") as he offered the day's sacrifices and prayed for his success. During the Babylonian captivity (586–537 BCE) the men of the Great Assembly[dubious – discuss] formalized and standardized the language of the Jewish prayers. Prior to that people prayed as they saw fit, with each individual praying in his or her own way, and there were no standard prayers that were recited. Johanan ben Zakai, one of the leaders at the end of the Second Temple era, promulgated the idea of creating individual houses of worship in whatever locale Jews found themselves. This contributed to the continuity of the Jewish people by maintaining a unique identity and a portable way of worship despite the destruction of the Temple, according to many historians. Synagogues in the sense of purpose-built spaces for worship, or rooms originally constructed for some other purpose but reserved for formal, communal prayer, however, existed long before the destruction of the Second Temple. [unreliable source?] The earliest archaeological evidence for the existence of very early synagogues comes from Egypt, where stone synagogue dedication inscriptions dating from the 3rd century BCE prove that synagogues existed by that date. [unreliable source?] More than a dozen Jewish (and possibly Samaritan) Second Temple era synagogues have been identified by archaeologists in Israel and other countries belonging to the Hellenistic world. It has been theorized that the synagogue became a place of worship in the region upon the destruction of the Second Temple during the First Jewish–Roman War; however, others speculate that there had been places of prayer, apart from the Temple, during the Hellenistic period. The popularization of prayer over sacrifice during the years prior to the destruction of the Second Temple in 70 CE had prepared the Jews for life in the diaspora, where prayer would serve as the focus of Jewish worship. Despite the possibility[dubious – discuss] of synagogue-like spaces prior to the First Jewish–Roman War, the synagogue emerged as a stronghold for Jewish worship upon the destruction of the Temple. For Jews living in the wake of the Revolt, the synagogue functioned as a "portable system of worship". Within the synagogue, Jews worshipped by way of prayer rather than sacrifices, which had previously served as the main form of worship within the Second Temple. The Samaritan house of worship is also called a synagogue. During the 3rd and 2nd centuries BCE, during the Hellenistic period, the Greek word used in the Diaspora by Samaritans and Jews was the same: proseucheµ (literally, a place of prayer); a later, 3rd or 4th century CE inscription, uses a similar Greek term: eukteµrion (prayer house). The oldest Samaritan synagogue discovered so far is from Delos in the Aegean Islands, with an inscription dated between 250 and 175 BCE, while most Samaritan synagogues excavated in the wider Land of Israel and ancient Samaria in particular, were built during the 4th-7th centuries, at the very end of the Roman and throughout the Byzantine period. Orthography. When the Samaritan script is used, there are some Hebrew words which would be spelled in a way typical only for the Samaritan Pentateuch, for instance "forever" is written 'lmw instead of l'lm. When Greek is the language used in inscriptions, typically, Samaritans may contract two Hebrew words into one, such har (mountain) and Gerizim becoming, in Greek, Argarizein. Orientation: the facade, or entrance of the Samaritan synagogue, is typically facing towards Mount Gerizim, which is the most holy site to Samaritans, while Jewish synagogues would be oriented towards Jerusalem and the Temple Mount. Decoration: the mosaic floor and other architectural elements or artifacts are sometimes decorated with typical symbols. As the Samaritans have historically adhered more strictly to the commandment forbidding the creation of any "graven image", they would not use any depictions of man or beast. Representations of the signs of the zodiac, of human figures or even Greek deities such as the god Helios, as seen in Byzantine-period Jewish synagogues, would be unimaginable in Samaritan buildings of any period. A representation of Mount Gerizim is a clear indication of Samaritan identity. On the other hand, although the existence of a Samaritan temple on Mount Gerizim is both mentioned by Josephus and confirmed by archaeological excavation at its summit, the temple's early destruction in the 2nd century BCE led to its memory disappearing from Samaritan tradition, so that no temple-related items would be found in Samaritan synagogue depictions. Religious implements, such as are also known from ancient Jewish synagogue mosaics (menorah, shofar, shewbread table, trumpets, incense shovels, and specifically the facade of what looks like a temple or a Torah shrine) are also present in Samaritan ones, but the objects are always related to the desert Tabernacle, the Ark of the Covenant within the Tabernacle, or the Torah shrine in the synagogue itself. Samaritans believe that at the end of time the Tabernacle and its utensils will be recovered from the place they were buried on Mount Gerizim and as such play an important role in Samaritan beliefs. Since the same artists, such as mosaicists, worked for all ethno-religious communities of the time, some depictions might be identical in Samaritan and Jewish synagogues, Christian churches and pagan temples, but their significance would differ. Missing from Samaritan synagogue floors would be images often found in Jewish ones: the lulav (palm-branch) and etrog (lemon-like fruit) have a different ritual use by Samaritans celebrating Sukkot, and do not appear on mosaic floors. Ritual baths near the synagogue after 70 CE: Jews abandoned the habit of building mikva'ot next to their houses of worship after the 70 CE destruction of the Jerusalem Temple, but Samaritans continued with the practice. Ancient Samaritan synagogues are mentioned by literary sources or have been found by archaeologists in the Diaspora, in the wider Holy Land, and specifically in Samaria. Delos: a Samaritan inscription has been dated to between 250 and 175 BCE. Rome and Tarsus: ancient literature offers hints that Samaritan synagogues may have existed in these cities between the fourth and sixth centuries CE. Thessaloniki and Syracuse: short inscriptions found there and using the Samaritan and Greek alphabet may originate from Samaritan synagogues. Sha'alvim synagogue, discovered in Judea, northwest of Jerusalem. Probably built in the 4th or 5th century CE and destroyed in the 5th or 6th. 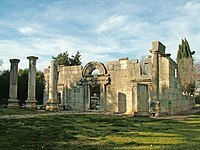 Beth Shean, "Synagogue A". A room added to an existing building in the late 6th or early 7th century CE served as a Samaritan synagogue. During the first Christian centuries, Jewish-Christians used houses of worship known in academic literature as synagogue-churches. Scholars have claimed to have identified such houses of worship of the Jews who had accepted Jesus as the Messiah in Jerusalem and Nazareth. Historically, synagogues were built in the prevailing architectural style of their time and place. Thus, the synagogue in Kaifeng, China looked very like Chinese temples of that region and era, with its outer wall and open garden in which several buildings were arranged. The styles of the earliest synagogues resembled the temples of other cults of the Eastern Roman Empire. The surviving synagogues of medieval Spain are embellished with mudéjar plasterwork. The surviving medieval synagogues in Budapest and Prague are typical Gothic structures. With the emancipation of Jews in Western European countries, which not only enabled Jews to enter fields of enterprise from which they were formerly barred, but gave them the right to build synagogues without needing special permissions, synagogue architecture blossomed. Large Jewish communities wished to show not only their wealth but also their newly acquired status as citizens by constructing magnificent synagogues. These were built across Western Europe and in the United States in all of the historicist or revival styles then in fashion. Thus there were Neoclassical, Neo-Byzantine, Romanesque Revival, Moorish Revival, Gothic Revival, and Greek Revival. There are Egyptian Revival synagogues and even one Mayan Revival synagogue. In the 19th century and early 20th century heyday of historicist architecture, however, most historicist synagogues, even the most magnificent ones, did not attempt a pure style, or even any particular style, and are best described as eclectic. All synagogues contain a Bimah, a large, raised, reader's platform (called teḇah (reading dais) by Sephardim), where the Torah scroll is placed to be read. In Sephardi synagogues it is also used as the prayer leader's reading desk. In Ashkenazi synagogues, the Torah was read on a reader's table located in the center of the room, while the leader of the prayer service, the hazzan, stood at his own lectern or table, facing the Ark. In Sephardic synagogues, the table for reading the Torah (reading dais) was commonly placed at the opposite side of the room from the Torah Ark, leaving the center of the floor empty for the use of a ceremonial procession carrying the Torah between the Ark and the reading table. Most contemporary synagogues feature a lectern for the rabbi. The Torah Ark, called in Hebrew ארון קודש Aron Kodesh or 'holy chest', and alternatively called the heikhal—היכל or 'temple' by Sephardic Jews, is a cabinet in which the Torah scrolls are kept. The Ark is reminiscent of the Ark of the Covenant, which held the tablets inscribed with the Ten Commandments. This is the holiest spot in a synagogue, equivalent to the Holy of Holies. The Ark is often closed with an ornate curtain, the parochet פרוכת, which hangs outside or inside the ark doors. Other traditional features include a continually lit lamp or lantern, usually electric in contemporary synagogues, called the ner tamid (נר תמיד), the "Eternal Light", used as a way to honor the Divine Presence. Originally, synagogues were made devoid of much furniture, the Jewish congregants in Spain, the Maghreb (North Africa), Babylonia, the Land of Israel and Yemen having a custom to sit upon the floor, which had been strewn with mats and cushions, rather than upon chairs or benches. In other European towns and cities, however, Jewish congregants would sit upon chairs and benches. Today, the custom has spread in all places to sit upon chairs and benches. Until the 19th century, in an Ashkenazi synagogue, all seats most often faced the Torah Ark. In a Sephardic synagogue, seats were usually arranged around the perimeter of the sanctuary, but when the worshipers stood up to pray, everyone faced the Ark. Many current synagogues have an elaborate chair named for the prophet Elijah, which is only sat upon during the ceremony of Brit milah. In ancient synagogues, a special chair placed on the wall facing Jerusalem and next to the Torah Shrine was reserved for the prominent members of the congregation and for important guests. This might be what Jesus referred to as the "seat of Moses" or "chair of Moses" (Matthew 23:2-3), or is mentioned as the "chief seats in the synagogues" elsewhere in the Gospels (Luke 11:43, 20:46; Matthew 23:6 etc.). Such a stone-carved and inscribed seat was discovered at archaeological excavations in the synagogue at Chorazin in Galilee and dates from the 4th–6th century; another one was discovered at the Delos Synagogue, complete with a footstool, reminiscent of James 2:1–6: "... you say to the poor man, “You stand over there, or sit down by my footstool.”"
In Yemen, the Jewish custom was to take-off one's shoes immediately prior to entering the synagogue, a custom that had been observed by Jews in other places in earlier times. Today, the custom of removing one's shoes is no longer practiced in Israel. Orthodox synagogues feature a partition (mechitza) dividing the men's and women's seating areas, or a separate women's section located on a balcony. The German-Jewish Reform movement, which arose in the early 19th century, made many changes to the traditional look of the synagogue, keeping with its desire to simultaneously stay Jewish yet be accepted by the host culture. In following decades, the central reader's table, the Bimah, was moved to the front of the Reform sanctuary—previously unheard-of in Orthodox synagogues. Gender separation was also removed. Since many Orthodox and some non-Orthodox Jews prefer to collect a minyan (a quorum of ten) rather than pray alone, they commonly assemble at pre-arranged times in offices, living rooms, or other spaces when these are more convenient than formal synagogue buildings. A room or building that is used this way can become a dedicated small synagogue or prayer room. Among Ashkenazi Jews they are traditionally called shtiebel (שטיבל, pl. shtiebelekh or shtiebels, Yiddish for "little house"), and are found in Orthodox communities worldwide. Another type of communal prayer group, favored by some contemporary Jews, is the Chavurah (חבורה, pl. chavurot, חבורות), or prayer fellowship. These groups meet at a regular place and time, either in a private home or in a synagogue or other institutional space. In antiquity, the Pharisees lived near each other in chavurot and dined together to ensure that none of the food was unfit for consumption. The Great Synagogues of Warsaw and Łódź, destroyed by Nazis during World War II. The Leopoldstädter Tempel of Vienna, destroyed during the "Kristallnacht" pogrom. Served as model for many other important synagogues. The Dohány Street Synagogue in Budapest, Hungary, is the largest synagogue in Europe by square footage and number of seats. It seats 3,000, and has an area of 1,200 m2 (13,000 sq ft) and height of 26 m (85 ft) (apart from the towers, which are 43 m or 141 ft). The Subotica Synagogue is located in Subotica, Serbia, seating more than 900. Congregation Yetev Lev D'Satmar (Rodney Street, Brooklyn) is also said to seat "several thousand". Temple Emanu-El of New York, a Reform Temple, is located in New York City, with an area of 3,523 m2 (37,920 sq ft), seating 2,500. It is the largest Reform synagogue in the world. Temple Emanu-El (Miami Beach, Florida) located in Miami Beach, Florida, seats approximately 1,400 people. Congregation Shaare Zion, an Orthodox Sephardic synagogue located in Brooklyn, New York, is the largest Syrian Jewish congregation in New York City. It is attended by over 1,000 worshipers on weekends. Beth Tzedec Congregation in Toronto, Ontario, is the largest Conservative synagogue in North America. The oldest synagogue fragments are stone-carved synagogue dedication inscriptions found in Middle and Lower Egypt and dating from the 3rd century BCE. The Old Synagogue in Erfurt, Germany, parts of which date to c.1100, is the oldest intact synagogue building in Europe. It is now used as a museum of local Jewish history. Jew's Court, Steep Hill, Lincoln, England, is arguably the oldest synagogue in Europe in current use. Congregation Shearith Israel, in New York City, founded in 1654, is the oldest congregation in the United States. Its present building dates from 1897. The Worms Synagogue in Germany, built in 1175 and razed on Kristallnacht in 1938, was painstakingly reconstructed using many of the original stones. It is still in use as a synagogue. The Synagogue of El Transito of Toledo, Spain, was built in 1356 by Samuel ha-Levi, treasurer of King Pedro I of Castile. This is one of the best examples of Mudéjar architecture in Spain. The design of the synagogue recalls the Nasrid style of architecture that was employed during the same period in the decorations of the palace of the Alhambra in Granada as well as the Mosque of Córdoba. Since 1964, this site has hosted a Sephardi museum. The Abdallah Ibn Salam Mosque or Oran, Algeria, built in 1880, but converted into a mosque in 1975 when most Algerian Jews had left the country for France following independence. The Nidhe Israel Synagogue ("Bridgetown Synagogue") of Barbados, located in the capital city of Bridgetown, was first built in 1654. It was destroyed in the hurricane of 1831 and reconstructed in 1833. 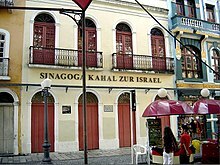 The Curaçao synagogue or Snoa in Willemstad, Curaçao, Netherlands Antilles was built by Sephardic Portuguese Jews from Amsterdam and Recife, Brazil. It is modeled after the Esnoga in Amsterdam. Congregation Mikvé Israel built this synagogue in 1692; it was reconstructed in 1732. 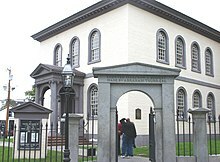 The Bialystoker Synagogue on New York's Lower East Side, is located in a landmark building dating from 1826 that was originally a Methodist Episcopal Church. The building is made of quarry stone mined locally on Pitt Street, Manhattan. It is an example of federal architecture. The ceilings and walls are hand-painted with zodiac frescos, and the sanctuary is illuminated by 40-foot (12.19 m) stained glass windows. The bimah and floor-to-ceiling ark are handcarved. Boston's 1920 Vilna Shul is a rare surviving intact Immigrant Era synagogue. The Congregation Or Hatzafon "Light of the North", Fairbanks, Alaska, is the world's northern most synagogue building. The Great Synagogue of Basel in Basel, Switzerland. Kadoorie Synagogue in Porto, Portugal. The largest synagogue in the Iberian Peninsula. The Baal Shem Tov's shul in Medzhybizh, Ukraine (c. 1915), destroyed and recently rebuilt. The Belzer synagogue of Belz, Ukraine. It no longer exists. Or Zaruaa Synagogue, Jerusalem, Israel founded in 1926. The remains of the Hurva Synagogue as they appeared from 1977 to 2003. The synagogue has been rebuilt in 2010. Székesfehérvár Neolog synagogue, Hungary (1869; photo: c. 1930s). It no longer exists, however, the memorial plaques were moved to a building at the city's Jewish cemetery. The Ohev Sholom Talmud Torah, the National Synagogue (opened 1960), mid-century building with expressionist overtones; Washington, D.C.
^ Judaism 101: Synagogues, Shuls and Temples. Jewfaq.org. ^ a b Donald D. Binder. "Second Temple Synagogues". ^ a b Donald D. Binder. "Egypt". ^ Schiffman, Lawrence (March 1991). From Text to Tradition: A History of Second Temple and Rabbinic Judaism (1st ed.). Ktav Pub Inc. p. 159. ISBN 0881253723. ^ Schiffman, Lawrence (March 1991). From Text to Tradition: A History of Second Temple and Rabbinic Judaism (1st ed.). Ktav Pub Inc. p. 164. ISBN 0881253723. ^ a b c d e f g h i j k l m n o p q r s t u v w x y z aa Pummer, Reinhard. "How to Tell a Samaritan Synagogue from a Jewish Synagogue". Biblical Archaeology Review. May/June 1998 (24:03) – via Center for Online Judaic Studies, cojs.org. ^ Taylor, Joan E. (1993). Christians and the Holy Places: The Myth of Jewish-Christian Origins. Clarendon Press. p. 338. ISBN 9780198147855. Retrieved 1 September 2018. ^ Emmett, Chad Fife (1995). Beyond the Basilica: Christians and Muslims in Nazareth. University of Chicago Geography Research Papers (Book 237). University of Chicago Press. p. 22. ISBN 978-0-226-20711-7. Retrieved 1 September 2018. ^ "Ner Tamid: The Eternal Light." Chabad. 28 August 2018. ^ Maimonides, Mishne Torah (Hil. Tefillah 11:4), who wrote: "Synagogues and houses of study must be treated with respect. They are swept and sprinkled to lay the dust. In Spain and in the Maghreb (North Africa), in Babylon and in the Holy Land, it is customary to kindle lamps in the synagogues and to spread mats on the floor on which the worshipers sit. In the land of Edom (i.e. Christian countries) they sit in synagogues upon chairs." ^ Zaklikowski, David. "The Chair of Elijah and Welcoming the Baby". Chabad.org. Retrieved 13 September 2018. ^ Joseph Kafih, Jewish Life in Sanà, Ben-Zvi Institute: Jerusalem 1982, p. 64 (note 3) ISBN 965-17-0137-4. There, Rabbi Kafih recalls the following story in the Jerusalem Talmud (Baba Metzi'a 2:8): “Yehudah, the son of Rebbe, entered a synagogue and left his sandals [outside], and they were stolen. He then said, 'Had I not gone to the synagogue, my sandals would not have gone-off. '” The custom of never entering a synagogue while wearing one's shoes is also mentioned in the Cairo Geniza manuscripts: "While he is yet outside, let him take-off his shoes or sandals from his feet and then enter barefoot, since such is the way of servants to walk barefoot before their lords... We have a minor sanctuary, and we are required to behave with sanctity and fear [in it], as it says: And you shall fear my hallowed place." (v. Halakhot Eretz Yisrael min ha-Geniza [The Halacha of the Land of Israel from the Geniza], ed. Mordechai Margaliot, Mossad Harav Kook: Jerusalem 1973, pp. 131–132; Taylor-Schechter New Series 135, Cambridge University Library / Oxford MS. 2700). ^ Alan F. Segal, Rebecca's Children: Judaism and Christianity in the Roman World, Harvard University Press, 1986, 125. ^ 1340 seats, the synagogue is 48 meters long, 35 meters wide, and 48.6 meters high. ^ Nathan Jeffay (January 12, 2011). "The Heart of Israel's Reform Judaism". The Forward. ^ Kulish, Nicholas (30 December 2007). "Out of Darkness, New Life". The New York Times. Retrieved 2008-03-12. ^ Snyder, S. C. (2008). Acculturation and Particularism in the Modern City: Synagogue Building and Jewish Identity in Northern Europe. University of Michigan. ISBN 9780549818977. Retrieved 2014-12-07. ^ Rabbi Yitschak Rudomin. "Rebbes, Hasidim, and Authentic Kehillahs". The Second World War and Jewish Education in America: The Fall and Rise of Orthodoxy. Jewish Professionals Institute (JPI). ^ Donald D. Binder. "Delos". ^ "Nidhe Israel Synagogue". planetware. ^ "Congregation Or HaTzafon". mosquitonet.com. Archived from the original on 2014-09-20. Retrieved 2014-12-07.